I decided on something quite bright for Mani-Monday! 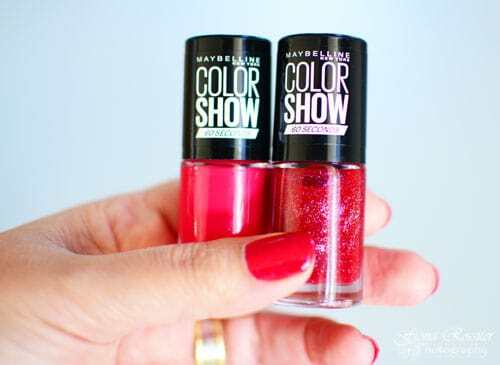 I was recently sent a few of the new Maybelline Color Show Nail Poilsh shades to try – these two caught my eye immediately! As you know I simply cannot resist pink nail polish and the brighter the better! The first colour I used to create the look below is Maybelline Color Show Park Avenue Pink, which is a gorgeous cerise pink. I painted a coat of Maybelline Color Show Wine Shimmer, over the Park Avenue Pink, to create a pretty sparkly effect. Wine Shimmer is a pinky red shade, with fine iridescent glitter. I think this look would be particularly good for wearing out in the evening – to a glamorous event or dinner party. It will look especially good against black! The Maybelline Color Show Nail Polish, applies very easily and is fast drying, as the label indicates – in 60 Seconds! I could have gotten away with one coat of Park Avenue Pink, if I was only wearing the one colour. I think Maybelline Color Show Nail Polish is a winner! It applies well, is fast-drying, reasonably priced and looks great. I am not sure about how well it lasts yet, that remains to be seen but it definitely gets a thumbs up from me! Could I please ask you to email me SDS for nail enamel, top and base coat.